Traditional Mid Terrace home in the ever popular area of Earlsdon. Having been tastefully refurbished throughout it is in keeping with the style of property and will suit a wide range of potential buyers. It is within a short walking distance to the buzzing Earlsdon High Street with it's numerous shops, bars and restaurants. With three double bedrooms, spacious through lounge, kitchen with breakfast bar and downstair w/c, this property has great space throughout. Externally to the rear is a wonderful courtyard style garden with two seating areas and mature plants/trees enclosing. We highly recommened viewing to fully appreciate everything on offer. Entrance Hall : , Doors leading to the ground floor accommodation and stairs rising to the first floor. Open Plan Lounge / Diner : 7.9m x 3.2m (26' x 10'6"), Having two fire places, laminate flooring throughout, double glazed bay window to the front aspect, double glazed window to the rear aspect and a central heated radiator. Kitchen : 3.6m x 2.6m (11'8" x 8'6"), Matching range of wall and base mounted units with roll top work surfaces over, a breakfast bar, stainles steel sink with mixer tap, space for range cooker, extractor hood over, tiled flooring, double glazed window to the side aspect. Utility Room : , Matching range of wall and base mounted units, space for appliances and access to a cupboard. Cloakroom : , Having a low level W/C, pedestal wash basin and a double glazed opaque window to the rear aspect. Landing : , Doors leading to the first floor accommodation and access to a cupboard. Bedroom One : 4.1m x 3.3m (13'6" x 10'11"), Double glazed bay window and a double glazed window to the front aspect and a central heated radiator. Bedroom Two : 3.8m x 2.5m (12'5" x 8'3"), Double glazed window to the rear aspect and a central heated radiator. Bedroom Three : 3.8m x 2.6m (12'7" x 8'5"), Double glazed window to the rear aspect and a central heated radiator. Bathroom : , Panelled bath with shower over, low level W/C, pedestal wash basin, double glazed opaque window to the side aspect and a central heated radiator. 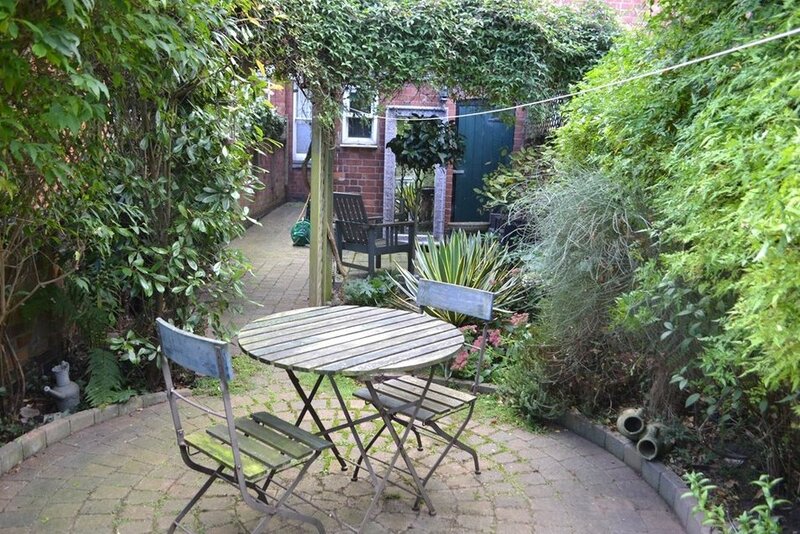 Rear Garden : , Block paved garden with raised borders having flowers, plants and bushes to the boundaries.